Jump into the Abyss and learn to communicate and path work with the Daemonic Divine through ascension practice. 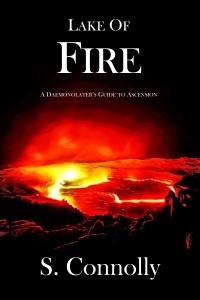 In Lake of Fire: A Daemonolater’s Guide to Ascension, Daemonolatress S. Connolly discusses the practice of ascension in theory and technique. Included are ascension formulas, meditations, astral work, dream work, and fear facing rituals meant to help the practitioner traverse their own lake of fire, and stare into the abyss. Also included is commentary on the practice of ascension, gleaned from over thirty years of working with the Daemonic Divine. Tagged ascension, channeling, path work, speaking with Daemons. Bookmark the permalink. It provided the last bit of info I needed, now all I need is to put it to practice.